FRIDAY, 08 JANUARY – Fans of Royal Dean’s Cookies can now heave a sigh of relief as this Universiti Malaysia Sabah (UMS) product is now on sale again. 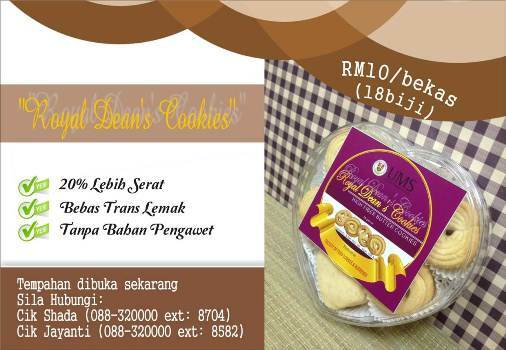 The biscuits, produced by the Faculty of Food Science and Nutrition (FSMP) is now on sale at only RM10 per container. The sale is open to students, staff and the public. A container of Royal Dean’s Cookies contains 18 crispy biscuits that contain 20% more fibre, trans fat free and no preservatives.